Do antipsychotic drugs improve working memory impairment caused by increased dopamine release during relapse phases of schizophrenia? This review summarizes the process by which working memory improves during the relapse phase of high dose antipsychotic therapy for schizophrenia, and presents a hypothesis as to why dopamine-related symptoms appear so strongly during the relapse phase with high dose antipsychotic therapy. Cognitive function related to dopamine in patients with schizophrenia varies depending on the levels of dopamine release and the dose of antipsychotics. Dopamine release is increased during the relapse phase in patients with schizophrenia. When high dose antipsychotic therapy is administered, working memory performance is low during the remission phase and increases during the relapse phase. Because the symptoms that are dependent on dopamine function are expected to show similar changes, we investigated the possibility that dopamine-related symptoms are not observed during the remission phase but may manifest during the relapse phase. The relationship between dopamine (DA) levels and working memory (WM) function has been illustrated by means of an inverted U-shaped curve (Arnsten, 1998). Too much as well as too little DA stimulation in the prefrontal cortex (PFC) impairs WM performance. Exposure to stress increases DA release in the PFC and impairs WM; however, pretreatment with antipsychotic drugs to block D1 receptors can prevent impairment of WM performance (Murphy et al., 1996; Arnsten et al., 1998). In addition, Brozosky et al. (1979) revealed that WM deficits in primates that have been caused by DA depletion can be reversed by DA agonists. It is conceivable that WM dysfunction caused by increased DA release can be ameliorated in patients administering antipsychotic drugs; this includes patients with schizophrenia. An electronic search of the Medline database for literature describing relationship between antipsychotic agents polypharmacy and intelligence from 1946 to 2018 was performed using the following conditions: Antipsychotic Agents (MeSH Terms) AND Polypharmacy (MeSH Terms) AND Intelligence (MeSH Terms) OR Recurrence (MeSH Terms). In addition, an electronic search of the Medline database for methods of dopamine release was completed. This included publications prior to March, 2018, with the following search criteria: stress, dopamine agonists and dopamine antagonists. Subsequent searches were completed that were specifically relevant to each method discussed in the dopamine release with the following terms: reversal learning, delusions, goal directed behavior, reward learning, and motivation. Searches were run from 03/11/2015 to 31/03/2018. The full electronic searches are shown in [Table 1]. Exposure to stress enhances release of DA in the striatum and the PFC (Pruessner et al., 2004; Lataster et al., 2011; Mizrahi et al., 2012). Laruelle et al. (1999) reported that increased DA release in the striatum caused deteriorated symptoms in patients with schizophrenia. Furthermore, relapse has been classified as a hyperdopaminergic state (Abi-Darghame et al., 1998; Abi-Dargham et al., 2000). Maintenance doses of antipsychotics recommended by various guidelines lie in the range of 200–800 mg chlorpromazine equivalent per day (CPZ eq./d). This is designed to optimize cognitive function performance in general ([Figure 1], remission phase). 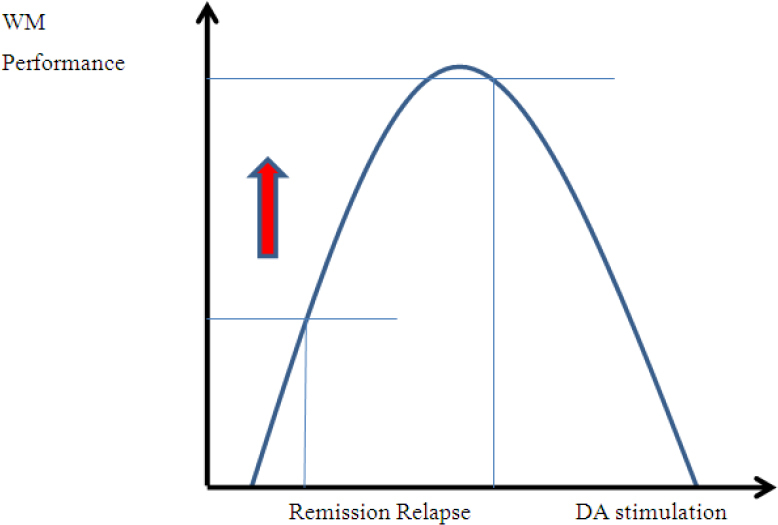 Under a standard dose, increased DA release is known to impair the performance of WM and other functions ([Figure 1], relapse phase). Treatment with over 1000 mg CPZ eq./d of psychiatric drugs is classified as a high-dose antipsychotic prescription (Lehman et al., 1998; Freudenreich et al., 2002). In addition, DA transmission is intensively suppressed in schizophrenic patients receiving high-dose psychiatric therapy ([Figure 2], remission phase). Thus, the performance related to DA function during the remission phase is conceivably low. 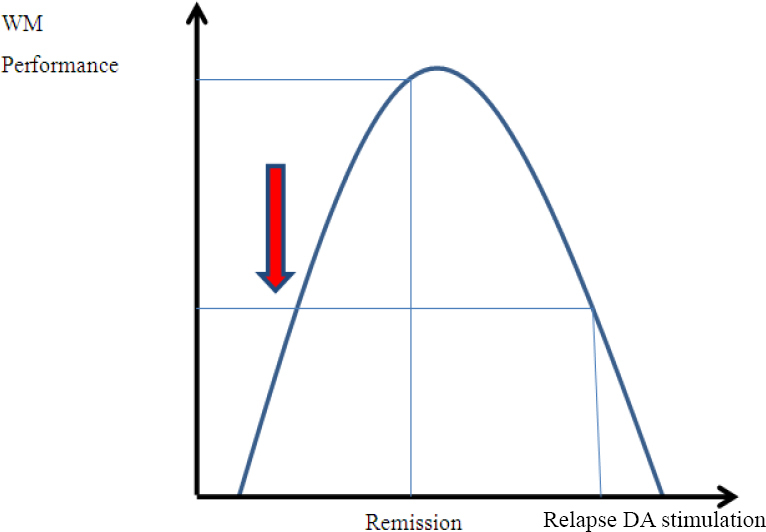 Furthermore, increased DA release is expected to contribute to the improvement of WM function ([Figure 2], relapse phase). Figure 1: Relationship of working memory (WM) performance and dopamine (DA) stimulation under a standard dose of an antipsychotic drug. Figure 2: Relationship of working memory (WM) performance and dopamine (DA) stimulation under high-dose antipsychotic therapy. Ataniya et al. (2017) compared the cognitive and intellectual functions of a schizophrenia remission group receiving high-dose antipsychotic therapy with those of a relapse group receiving high-dose antipsychotic therapy and whose DA release was assumed to be increased. Compared with the remission group, patients in the relapse group performed significantly better on the WM test. However, with reference to the other functions including cognitive and intellectual functions, their performance was lower. A cognitive function test must be standardized to compare among different test populations as well as within one particular test population. Because DA activity declines with age (Arnsten et al., 1994; Volkow et al., 1998), the present study employed the Wechsler Adult Intelligence Scale-Revised (WAIS-R; Wechsler, 1997), which can be corrected for age; the age correction and standardization is easy. Of the subtests of WAIS-R, the Digit Span Test was chosen to evaluate WM. Studies of semantic dementia indicated that performance in the Vocabulary test is associated with the frontal cortex and temporal lobe (Martin and Chao, 2001), which suggests the involvement of a top-down process. Studies have also consistently shown that performance in the Block Design test is associated with the right parietal lobe (Glascher et al., 2009). This indicates a strong involvement of a bottom-up process from sensory input. Accordingly, the vocabulary and the Block Design tests were selected as predictive factors. Heinrichs et al. (1998) revealed that the cognitive function test scores, including the IQ test in its entirety, and the Digit Span, Vocabulary and Block Design tests, were lower in patients in the chronic phase schizophrenia group than those in the normal control group; the standard deviation (SD) was approximately –0.6 to –1.2. Contrarily, the results of the reviewed study revealed that the cognitive function test scores of the high-dose therapy remission group were lower than those of the normal control group scores (–1.1 to –1.8 SD). The cognitive function test scores of the relapse group were much lower than those of the normal control group scores (–1.8 to –2.7 SD); however, only the relapse group score for Digit Span was equivalent to the average score of chronic phase schizophrenia group (–0.6 SD). High-dose antipsychotic therapy impairs cognitive function (Hori et al., 2006; Kawai et al., 2006; Knowles et al., 2010). More anticholinergic drugs are needed for antipsychotic therapy than for standard dose therapy. In addition, concomitant administration of antipsychotics and anticholinergic drugs further exacerbates cognitive impairment (Minzenberg et al., 2004; Ogino et al., 2014). The results of the reviewed study, which found impairment of cognitive and intellectual functions during the remission phase of patients receiving high-dose antipsychotic therapy, are in accordance with the findings of the studies noted above. PFC provides top-down regulation of thought, goal-directed behavior and attention, and the ability to inhibit inappropriate impulses (Arnsten et al., 2015). Moreover, exposure to stress impairs PFC function. Norepinephrine (NE) receptors include alpha-1, alpha-2, and beta adrenergic receptors. In addition, NE has the highest affinity for alpha-2 receptors. Moderate levels of NE release strengthen PFC function through alpha-2A adrenoreceptors and weaken amygdala activity (Arnsten et al., 2000b). Stress not only increases DA release but NE release in the PFC (Finlay et al., 1995). High levels of NE release in the PFC engage lower affinity alpha-1 and beta-1 receptors and nullify the effects of alpha-2 receptor stimulation. Thus, high levels of NE release in the PFC impair PFC function (Arnsten et al., 2000a, b). PFC function impairment enhances subcortical and other cortical activities, thus strengthening the emotional responses of the amygdala (Davis et al., 1992), habitual responses of the basal ganglia (Elliott et al., 2008), and reflexive mechanism of the sensorimotor cortex and cerebellum. Therefore, control of behavior is replaced by a more primitive reaction (Ramos et al., 2007). The overall impairment of the cognitive intellectual functions revealed in the results is considered to be caused by PFC impairments under conditions of exposure to stress during the relapse phase. Although WM function improved during the relapse phase, PFC function was impaired. This suggests that improved WM function does not always enhance PFC function. Blocking the DA D1 receptor using antipsychotics can restore WM function under PFC dysfunction conditions. Conversely, one may question whether PFC dysfunction can be ameliorated by alpha-1 antagonists. One may further ask whether WM function is impaired or not if the PFC function is improved by alpha-1 antagonists without blocking DA D1 during the relapse phase in patients with schizophrenia. Alpha-2A agonists improve WM function (Wang et al., 2007). In addition, one may question whether PFC function is improved or not if an alpha-2A agonist is used. To answer the questions raised above, further research is warranted. Negative symptoms and general psychopathology are exacerbated in patients with schizophrenia receiving high doses of antipsychotics. Furthermore, these exacerbations might lead to a relapse. High-dose antipsychotic treatment is associated with a higher likelihood of side effects. For instance, the risk of hyperprolactinemia significantly increases when the D2 receptor occupancy by antipsychotics in the striatum exceeds 72%, and extrapyramidal symptoms significantly increase when the occupancy exceeds 78% (Kapur et al., 2000). Adverse subjective experiences also increase with increased D2 receptor occupancy in the striatum and temporal lobe (Mizrahi et al., 2007). Furthermore, high-dose treatment is associated with increased adverse effects; examples include deleterious effects on the cardiovascular, gastrointestinal, and dermatologic systems (Liu and De Haan, 2009). Psychological and physiological stress induces the increase of DA and NE release, thereby increasing the risk of relapse. Psychopathology in patients with schizophrenia is affected by antipsychotic drugs. Similar to cognitive function, the effects of antipsychotic drugs vary depending on the remission or relapse phases. Compared with patients treated with standard doses, patients with schizophrenia undergoing high-dose antipsychotic therapy may present an emergence or remarkable worsening of delusions or abnormal behavior during the relapse phase ([Figure 1], remission phase/relapse phase; [Figure 2], remission phase/relapse phase). The dopaminergic salience neuron responds to both aversive and rewarding events. A high DA D2 receptor blockade or stress-induced DA release may interfere with prediction error and reward learning, hence blockade of DA D2 receptors by antipsychotics could induce anhedonia (Wise, 1982). Goal-directed behavior is modulated by the mesolimbic DA system. This involves interactions of the PFC and mesolimbic DA system. A disruption in prediction error correlates with the severity of delusions in psychotic patients, impairment of the prediction error and reward predicting stimuli contribute to delusion formation (Corlett et al., 2007). Corlett et al. (2007) also reported that the correlation between the decrease in the prediction-error response signal measured in the right PFC and the unusual thoughts was significant. If alpha-1 stimulation weakens the PFC function because of high levels of NE release, prediction-error response signal will attenuate, and abnormal thoughts and delusions may occur or worsen. Decreased prediction error signal may cause disruptions in processing information necessary for goal-directed behavior in schizophrenia. Furthermore, patients with schizophrenia show reduced prediction errors in the ventral striatum and fail to respond to increased salience in the right PFC (Juckel et al., 2006). Patients with schizophrenia attribute incentive salience to otherwise irrelevant stimuli (Schlagenhauf et al., 2009). Irrelevant stimuli increase with increased DA release in the striatum (Jensen et al., 2008; Murray et al., 2008), whereas antipsychotic drugs decrease irrelevant stimuli. Mizrahi et al. (2012) reported psychosis-related DA release in the associative striatum. This finding is consistent with the observation that 18F-DOPA uptake is elevated in the associative striatum of patients with psychopathologic and neuropsychological impairments (Howes et al., 2009a, 2011). In patients with schizophrenia administering high-dose antipsychotic medications, irrelevant stimuli are strongly suppressed during remission ([Figure 2], remission phase). However, when DA release in the striatum increases during the relapse phase, irrelevant stimuli also increase ([Figure 2], relapse phase). Increased irrelevant stimuli worsen positive symptoms such as delusions and abnormal behavior. Conversely, patients who have schizophrenia and are being administered high-dose antipsychotics may show improved negative symptoms, for example, anhedonia and dysphoria during the relapse phase. A decrease in the ventromedial PFC function worsens impulsivity. Patients who have experienced damage to the ventromedial PFC have severely impaired behavior control and are unable to make decisions because of dysfunctional emotional control (Barrash et al., 2009). An adjustment to frustration, tolerance, and anxiety in patients with lesions in the ventromedial PFC correlates with their adaptability in real life (Anderson et al., 2006). PFC dysfunction has a negative influence on cognitive function, prediction error, and behavioral decisions. During relapse, irrelevant stimuli increase because of increased DA release in the striatum. Furthermore, PFC function declines due to increased NE release. An increase in irrelevant stimuli and a decline in the PFC function exacerbate unusual thoughts and delusions, thereby causing deterioration of goal-directed behavior and behavior control. In addition, regression of anhedonia and dysphoria may decrease behavior control and lead to disinhibition. A decrease in goal-directed behavior and behavior control lowers adaptability to everyday life; this may manifest as abnormal behavior coupled with an exacerbation of delusions. When administering a standard dose, abnormal DA-related functions may be obvious during remission ([Figure 1], remission phase). However, symptoms are expected to be relatively suppressed because the PFC function is maintained. During relapse, the PFC function decreases; this may lead to delusions and behavioral abnormalities. However, because DA release in the striatum is excessive, changes caused by irrelevant stimuli may be limited or even reduced ([Figure 1], relapse phase). Excessively blocking DA receptors using high doses of antipsychotics is undesirable. Use of high-dose antipsychotics is associated with more frequent adverse effects and deteriorating cognitive function, negative symptoms and general psychopathology. However, alpha-1 blockade in antipsychotics can protect PFC function during the relapse phase. Therefore, high-dose antipsychotic prescriptions can offer enhanced efficacy of cognitive function and symptoms related to the protection of PFC dysfunction. Despite lack of safety, high-dose antipsychotics can be effective when used in a restricted manner during the relapse phase. Abi-Dargham A, Rodenhiser J, Printz D, Zea-Ponce Y, Gil R, Kegeles L, Weiss R, Cooper T, Mann JJ, Van Heertum R, Gorman J, Laruelle M (2000) Increased baseline occupancy of D2 receptors by dopamine in schizophrenia. Proc Natl Acad Sci U S A 97:8104-8109. Abi-Dargham A, Gil R, Krystal J, Baldwin RM, Seibyl JP Bowers M, vanDyck CH, Charney DS, Innis RB, Laruelle M (1998) Increased striatal dopamine transmission in schizophrenia: Confirmation in a second cohort. Am J Psychiatry 155:761-767. Anderson S, Barrash J, Bechara A, Trannel D (2006) Impairments of emotion and real-world complex behavior following childhood- or adult-onset damage to ventromedial prefrontal cortex. J Int Neuropsychol Soc 12:224-235. Arnsten AF, Cai JX, Murphy BL, Goldman-Rakic PS (1994) DopamineD1 receptor mechanisms in the cognitive performance of young adult and aged monkeys. Psychopharmacology (Berl) 116:143-151. Arnsten AF, Goldman-Rakic PS (1998) Noise stress impairs prefrontal crortical cognitive function in monkeys. Evidence for a hyper dopaminergic mechanism Arch Gen Psychiatry 55:362-368. Arnsten AF (1998) Catecholamine modulation of prefrontal cortical cognitive function. Trends Cogn Sci 2:436-447. Arnsten AF (2000a) Stress impairs PFC function in rats and monkeys: role of dopamine D1 and norepinephrine alpha-1 receptor mechanisms. Prog Brain Res 126:183-192. Arnsten AF (2000b) Through the looking glass: differential noradrenergic modulation of prefrontal cortical function. Neural Plast 7:133-146. Arnsten AF, Raskind MA, Taylor FB, Connor DF (2015) The effects of stress exposure on prefrontal cortex: Translating basic research into successful treatments for post-traumatic stress disorder. Neurobiol Stress 1:89-99. Ataniya R, Saito M, Takahashi T (2017) Correlation between intellectual function and relapse of schizophrenia: dose reduction in patients undergoing high-dose antipsychotic therapy. Juntendo Medical Journal 63:449-457. Barrash J, Tranel D, Anderson SW (2000) Acquired personality disturbances associated with bilateral damage to the ventromedial prefrontal region. Dev Neuropsychol 18:355-381. Birnbaum SG, Gobeske KT, Auerbach J, Taylor JR, Arnsten AFT (1999) A role for norepinephrine in stressinduced cognitive deficits: Alpha-1-adrenoceptor mediation in prefrontal cortex. Biol Psychiatry 46:1266-1274. Brozoski TJ, Brown R, Rosvold HE, Goldman PS (1979) Cognitive deficit caused by regional depletion of dopamine in the prefrontal cortex of rhesus monkeys. Science 205:929-931. Corlett PR, Murray GK, Honey GD, Aitken MR, Shanks DR, Robbins TW, Bullmore ET, Dickinson A, Fletcher PC (2007) Disrupted prediction-error signal in psychosis: evidence for an associative account of delusions. Brain 130:2387-2400. Davis M (1992) The role of the amygdala in fear and anxiety. Annu Rev Neurosci 15:353-375. Elliott AE, Packard MG (2008) Intra-amygdala anxiogenic drug infusion prior to retrieval biases rats towards the use of habit memory. Neurobiol Learn Mem 90:616-623. Finlay JM, Zigmond MJ, Abercrombie ED (1995) Increased dopamine and norepinephrine release in medial prefrontal cortex induced by acute and chronic stress: effects of diazepam. Neuroscience 64:619-628. Freudenreich O, Goff DC (2002) Antipsychotic combination therapy in schizophrenia. A review of efficacy and risks of current combinations. Acta Psychiatr Scand 106:323-330. Glascher J, Tranel D, Paul LK, Rudrauf D, Rorden C, Hornaday A, Grabowski T, Damasio H, Adolphs R (2009) Lesion mapping of cognitive abilities linked to intelligence. Neuron 61:681-691. Heinrichs RW, Zakzanis KK (1998) Neurocognitive deficit in schizophrenia: a quantitative review of the evidence. Neuropsychology 12:426-445. Hori H, Noguchi H, Hashimoto R, Nakabayashi T, Omori M, Takahashi S, Tsukue R, Anami K, Hirabayashi N, Harada S, Saitoh O, Iwase M, Kanimoto O, Takeda M, Okabe S, Kunugi H (2006) Antipsychotic medication and cognitive function in schizophrenia. Schizophr Res 86:138-146. Howes OD, Montgomery AJ, Asselin MC, Murray RM, Valli I, Tabraham P, Bosch EB, Valmaggia L, Johns L, Broome M, McGuire PK, Grasbyet PM (2009) Elevated striatal dopamine function linked to prodromal signs of schizophrenia. Arch Gen Psychiatry 66:13-20. Howes O, Bose S, Turkheimer F, Valli I, Egerton A, Stahl D, Valmaggia L, Allen P, Murray R McGuire P (2011) Progressive increase in striatal dopamine synthesis capacity as patients develop psychosis: A PET study. Mol Psychiatry 16:885-886. Jensen J, Willeit M, Zipursky RB, Savina I, Smith AJ, Menon M, Crawley AP, Kapur S (2007) The formation of abnormal associations in schizophrenia: neural and behavioral evidence. Neuropsychopharmacology 28:294-302. Juckel G, Schlagenhauf F, Koslowski M, Wüstenberg T, Villringer A, Knutson B, Wrase J, Heinz A (2006) Dysfunction of ventral striatal reward prediction in schizophrenia. Neuroimage 29:409-416. Kapur S, Zipursky R, Jones C, Remington G, Houle S (2000) Relationship between dopamine D(2) occupancy, clinical response, and side effects: A double-blind PET study of first-episode schizophrenia. Am J Psychiatry 157:514-520. Kawai N, Yamakawa Y, Baba A, Nemoto K, Tachikawa H, Hori T, Asada T, Iidaka T (2006) High-dose of multiple antipsychotics and cognitive function in schizophrenia: The effect of dose-reduction. Prog Neuropsychopharmacol Biol Psychiatry 30:1009-1014. Knowles EEM, David AS, Reichenberg A (2010) Processing speed deficits in schizophrenia: reexamining the evidence. Am J Psychiatry 167:828-835. Laruelle M, Abi-Dargham A, Gil R, Kegeles L, Innis R (1999) Increased dopamine transmission in schizophrenia: relationship to illness phases. Biol Psychiatry 46:56-72. Lataster J, Collip D, Ceccarini J, Haas D, Booij L, Os J, Pruessner J, Laere KV, Germeys IM (2011) Psychosocial stress is associated with in vivo dopamine release in human ventromedial prefrontal cortex: A positron emission tomography study using [18F]fallypride. Neuroimage 58:1081-1089. Lehman AF, Steinwachs DM (1998) Translating research into practice: the Schizophrenia Patients Outcomes ResearchTeam (PORT) treatment recommendations. Schizophr Bull 24:1-10. Liu X, De Haan S (2009) Chlorpromazine dose for people with schizophrenia. Cochrane Database Syst Rev:CD007778. Martin A, Chao LL (2001) Semantic memory and the brain: structure and processes. Curr Opin Neurobiol 11:194-201. Minzenberg MJ, Poole JH, Benton C, Vinogradov S (2004) Association of anticholinergic load with impairment of complex attention and memory in schizophrenia. Am J Psychiatry 161:116-124. Mizrahi R, Rusjan P, Agid O, Graff A, Mamo DC, Zipursky RB, Kapur S (2007) Adverse subjective experience with antipsychotics and its relationship to striatal and extrastriatal D2 receptors: a PET study in schizophrenia. Am J Psychiatry 164:630-637. Mizrahi R, Addington J, Rusjan PM, Suridjan I, Ng A, Boileau I, Pruessner JC, Remington G, Houle S, Wilson AA (2012) Increased stress-induced dopamine release in psychosis. Biol Psychiatry 71:561-567. Murphy BL, Arnsten AFT, Goldman- Rakic PS, Roth RH (1996) Increased dopamine turnover in the prefrontal cortex impairs spatial working memory performance in rats and monkeys. Proc Natl Acad Sci U S A 93:1325-1329. Murray GK, Corlett PR, Clark L, Pessiglione M, Blackwell AD, Honey G, Jones PB, Bullmore ET, Robbins TW, Fletcher PC (2008) Substantia nigra/ventral tegmental reward prediction error disruption in psychosis. Mol Psychiatr 13:239:267-276. Ogino S, Miyamoto S, Miyake N, Yamaguchi N (2014) Benefits and limits of anticholinergic use in schizophrenia: Focusing on its effect on cognitive function. Psychiatry Clin Neurosci 68:37-49. Pruessner JC, Champagne F, Meaney MJ, Dagher A (2004) Dopamine release in response to a psychological stress in humans and its relationship to early life maternal care: A positron emission tomography study using [11C]raclopride. J Neurosci 24:2825-2831. Ramos BP, Arnsten AFT (2007) Adrenergic pharmacology and cognition: focus on the prefrontal cortex. Pharmacol Ther 113:523-536. Schlagenhauf F, Sterzer P, Schmack K, Ballmaier M, Rapp M, Wrase J, Juckel G, Gallinat J, Heinz A. (2009) Reward feedback alterations in unmedicated schizophrenia patients: relevance for delusions. Biol Psychiatry 65:1032-1039. Volkow ND, Gur RC, Wang GJ, Fowler JS, Moberg PJ, Ding YS, Hitzemann R, Smith G, Logan J (1998) Association between decline in brain dopamine activity with age and cognitive and motor impairment in healthy individuals. Am J Psychiatry 155:344-349. Wang M, Ramos BP, Paspalas CD, Shu Y, Simen A, Duque A, Vijayraghavan S, Brennan A, Dudley A, Nou E, Mazer JA, McCormick DA, Arnsten AF (2007) Alpha2A-adrenoceptor stimulation strengthens working memory networks by inhibiting cAMP-HCN channel signaling in prefrontal cortex. Cell 129:397-410. Wechsler D (1997) Wechsler adult intelligence test administration and scoring manual. San Antonio, Texas: The Psychology Corporation. Wise RA (1982) Neuroleptics and operant-behavior-the Anhedonia hypothesis. Behav Brain Sci 5:39-53. The author confirms being the sole contributor of this work. The Copyright License Agreement has been signed by the author before publication.